For over 110 years Camp Jewell YMCA has been helping people develop life skills that prepare them for future success. Our teambuilding programs are built around your needs. Surrounded by 540 acres of woodland we develop our programs to meet your needs. Our teambuilding participants leave with a springboard to transfer the unity, cooperation, and teamwork experienced during back home. Best of all, the laughing, playing and working together promote a sense of camaraderie and pride that lasts well beyond the stays at camp. Regardless of your group type our entire staff team is focused on ensuring that your stay at camp no matter how short makes memories that last a lifetime. Our teambuilding programs consist of a series of challenges for individuals and groups, requiring problem solving, communication, cooperation, trust and teamwork for their completion. The challenges draw on the strengths and commitment of each member of the group. Our staff will help you refine goal setting and explore the importance of trust and communication all while having a great time! 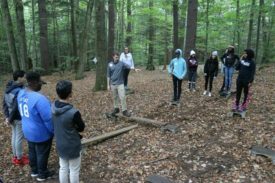 Through large and small group games, cooperative activities, problem-solving challenges and trust building activities, your group have the opportunity to come to know themselves and their peers in a new way. We build our programs around “Challenge by Choice”—a guideline that teaches participants to choose their level of participation within their own level of comfort and ability. 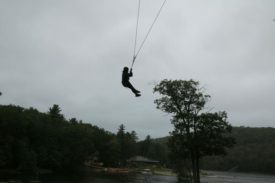 In addition to our low ropes activities, Camp Jewell YMCA has four high ropes elements that are spread out around camp. 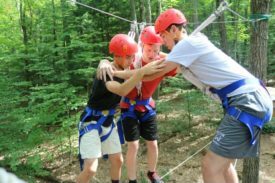 This enables us to serve different groups of participants at the same time, and allows each group to focus on their own goals and their high ropes experience without distractions from others. All of these facilities are facilitated by our highly trained and certified staff. Our Vertical Play Pen is a challenging ropes element that promises no two climbs will be the same. Two participants work together to try and reach the top using suspended tires, rope ladders, beams and ropes. Each level offers several options for getting to the next level and by working together participants learn more about their colleagues as well as themselves. The Giant Swing involves the participant being attached to a cable that is pulled up by their team to the height of their choice. When ready, a release cord is pulled and the participant swings. By involving the entire group, and allowing the participant to choose the challenge of their choice, all group members experience success together. will use proper climbing equipment and learn to support each other in an adventurous and exciting activity. Our high ropes course has a variety of obstacles, 25 feet in the air, designed to promote group cooperation and individual achievement. Participants will navigate through the course with state-of-the-art climbing gear while our trained staff provide support and encouragement. Guests will learn to support each other and work together through a course that challenges small groups to work together for success while in the air. In addition to these high ropes elements, Camp Jewell YMCA is home to two outdoor climbing walls. 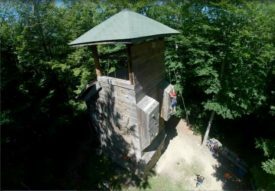 Mount Wood is located on main camp, while our larger climbing wall, Mount Meggido, is over 45 feet tall and can be found at Hide-A-Way Ranch. We also offer a wide range of recreational activities to complement your team building experience. We invite you to come discover the difference that is Camp Jewell YMCA! We would love to talk with you about bringing your group to Camp Jewell YMCA. If you have questions or would like to check current availability please call us at 888.412.2267 or email campjewell@ghymca.org.